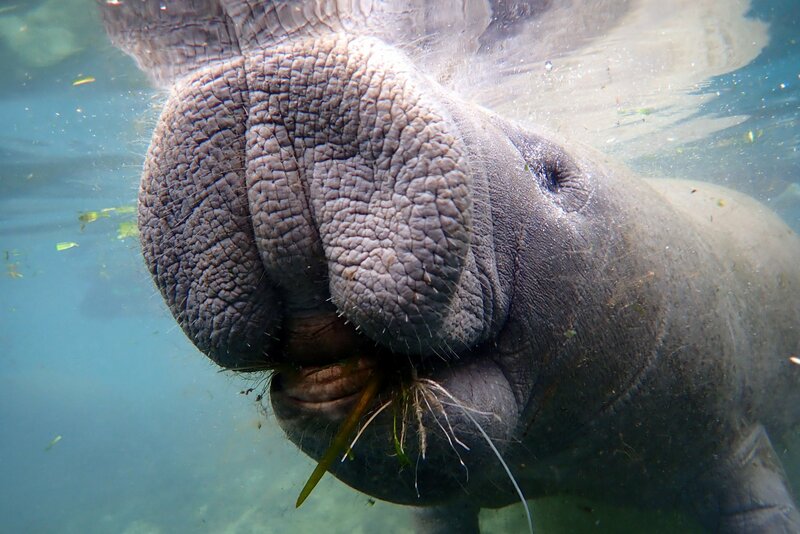 A Florida Manatee enjoying a nibble of seagrass. Manatees eat between 10% and 15% of their body weight daily! Greetings! Here’s the continuation of my blog on manatee facts (Part 2). It reviews some of the awesome manatee facts I’ve presented over these last few years! 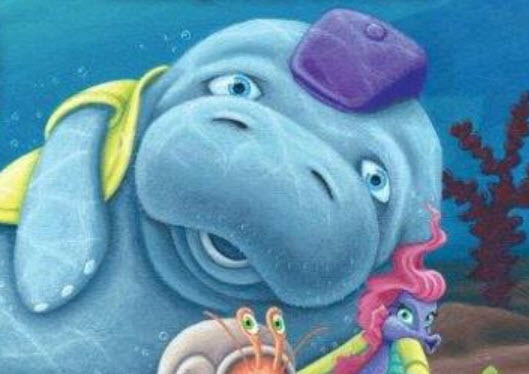 You may have learned from reading part 1’s blog, that both the Florida manatee and the Antillean manatee are subspecies of the West Indian manatee. And the United States is the only country where you’ll find the Florida manatee. All of us manatees are very slow moving, curious, marine mammals spending the majority of our time eating a nice vegetarian diet, resting, and traveling. Not a bad life! In general we manatees are rather shy. However, the curiosity bug is definitely wired into our brains. So if you happen to be paddle boarding or kayaking on waters where we frequent (estuaries, saltwater bays, canals, and coastal areas – especially where seagrass beds exist), don’t be surprised if one of us comes up to you and investigates what you’re doing! In very rare occasions, a manatee could actually poke its face right up on a paddleboard just to greet you! Another cool fact is that we manatees can actually tell the sizes of different objects. In fact, we have been known to respond to visual motion and cues from objects up to 115 feet away! As for our hearing, manatees have very large ear bones, which give us an apparently good range of sound frequencies. In general, manatees are very good at hearing high frequencies and not nearly as good at hearing low frequencies, which are usually associated with boat noise. This most likely explains why so many manatees are injured or killed in watercraft collisions each year. However, some good news here is that manatees most likely can hear the approach of propellers on boats, which have slowed down due to boat speed regulations in manatee zones. Manatees can communicate! We create sounds that can be best described as chirps, whistles or squeaks. The cow (female manatee) and her calf do a good amount of communicating. In fact, the cow can hear its calf’s squeals and calls from up to 200 feet away! Looking at the manatee diet, all of us manatees are herbivores (plant eaters). And we are usually really hungry. Why? Because manatees eat 10% to 15% of our bodyweight every day! That means a 1,000-pound manatee will eat 100 to 150 pounds of plants each day. Our diet consists of submerged seagrass beds and also freshwater vegetation. The most common marine seagrass in the manatee diet includes; manatee grass, turtle grass, shoal grass and widgeon grass. And the most common freshwater vegetation for the manatee diet includes; tape grass, eel grass, hydrilla, water lettuce, and water hyacinth. Stay tuned for more manatee facts coming up in future blogs!